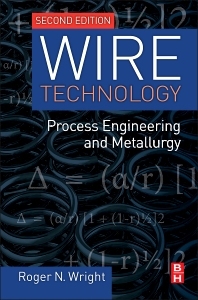 Wire Technology: Process Engineering and Metallurgy, Second Edition, covers new developments in high-speed equipment and the drawing of ultra-high strength steels, along with new computer-based design and analysis software and techniques, including Finite Element Analysis. In addition, the author shares his design and risk prediction calculations, as well as several new case studies. New and extended sections cover measurement and instrumentation, die temperature and cooling, multiwire drawing, and high strength steel wire. Coverage of process economics has been greatly enhanced, including an exploration of product yields and cost analysis, as has the coverage of sustainability aspects such as energy use and recycling. As with the first edition, questions and problems are included at the end of each chapter to reinforce key concepts. Mechanical Engineers, Materials Scientists (metals), wire drawing industry. 1.2 How Does Drawing Work? registered professional engineer and a fellow of ASM International and of the Society of Manufacturing Engineers.